There’s a certain pleasure in setting a book in the future, because a lovely thing about the future is that it hasn’t happened yet, and there’s an immense freedom in this. If you’re writing fiction set in the future, that future can be anything you want it to be. But in that freedom lies a certain risk: if the future can be anything, then how to anchor a narrative in the realm of the recognizable? It seems to me that in picking up a novel, any novel, a reader is always making a leap: as writers of fiction, we ask readers to pretend that our fictional characters are real enough to care about, and it’s a much higher imaginative hurdle when we place our fictional characters in a context that’s entirely made up. I often find myself thinking of Steven Soderbergh’s 2002 remake of Solaris. It’s a visually stunning film set somewhere in the future, far enough away from now that the plot involves space travel outside the solar system. The shots of the titular planet are ravishing, but I find them less striking than Soderbergh’s treatment of life on earth. It’s all rain and warm lamp light, beautiful in a muted way. This is the key, I think, to setting work in the future: it has to speak to the present. In fiction—either books or movies—the futures that are all clean lines and cold lighting are less resonant than the futures with warmth, because surely in the future we’ll still value lamp light, wooden cutting boards in the kitchen, the way rain slips down the outside of a window, dinner parties with friends in soft light. I think it’s an interesting measure of our fears and anxiety that such a vast number of films and books set in the future are dystopic. The New York Times ran a story on this recently, and once I got over the general disorientation of seeing my name and face in the paper—I was so flummoxed by the whole thing that I sent out a tweet about it with a glaring grammatical error that then got retweeted, oh I don’t know, approximately 70 times, because it’s an unshakeable rule of Twitter that the tweet with the glaring grammatical error is the one that gets retweeted the most—I was fascinated to realize how many of these books there were. I’d somehow missed Howard Jacobson’s J, for instance, and I hadn’t realized that Laura van den Berg’s forthcoming novel Find Me is post-apocalyptic, even though we talk on social media sometimes and have the same agent and met for coffee once. It probably say something about my proclivities that knowing the book is post-apocalyptic makes me want to read it even more. This, I think, is the key to the popularity of the genre: these narratives may be set in the future, but they’re an expression of our current fears. When my husband and I purchased a home last year, I insisted that we only look at properties on high ground. New York is an archipelago city, and I have friends here whose neighborhoods were under four feet of water when the last hurricane came through. The water receded, but perhaps it won’t always. The sea levels will continue to rise; storms will become more severe; I can’t help but wonder how different the shoreline will be in a decade, a century. I sometimes imagine gondolas on Wall Street. But then, has there ever been a time when civilization wasn’t threatened, when we didn’t fear that it would end? I had an interesting conversation with my mother once. She was reminiscing about the terror of the Cold War, the fear of nuclear annihilation; in the late seventies and early eighties, she said, she and her friends used to talk about how guilty they felt about bringing children into this dangerous world. Stories like that make me realize the extent to which we idolize the past. Perhaps when we set a book or film in the future, the real imaginative liberty we take is when we imagine that the people there won’t be like us: getting on with life but a little fretful, menaced by forces beyond our control, everyone waiting for whatever comes next. Thank you to Emily for contributing these great insights. 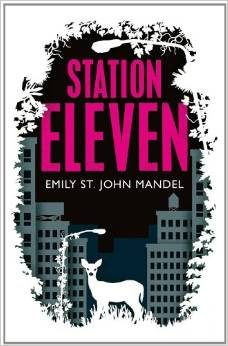 When a book provokes a powerful emotional response, as Station Eleven did, I find myself examining it more closely, not less. A more dispassionate reappraisal did nothing to lessen my admiration for this novel, both as a reader and particularly as a writer. This is a work of tremendous vision, imagination and humanity which demonstrates impressive control of a complex structure with multiple strands and perspectives that reward close attention. The reader is immersed in a future world so frighteningly relatable – with characters so real, their challenges so involving – that it provokes reflection on what is good and what is wrong in our own. Station Eleven is tense and disturbing but also uplifting and beautiful, both in the story it tells and the liquid prose in which it is written. This could have been a one-line review: it’s the best novel I’ve read all year. Emily will be visiting the UK late September/early October for various events around the country. Details here. Next week, to celebrate three year of the Literary Sofa, I’ll be launching the Literary Lunch competition – with book prizes too! Sounds very interesting. Yes, Emily’s right; we’ve always fretted about an impending apocalypse, and sooner or later, we may be right. Possibly it won’t come in the form we expect; and possibly it won’t be apocalyptic at all – tailing off more with a whimper than crashing out with a bang. Who knows. Thing is, we make small adjustments all the time, don’t we? Constantly inventing a new kind of normal. Sorry – wittering on. I’d heard of the book, but didn’t know what it was about, so thanks for this, Isabel. Defo going on my TBR pile. I’m dying to read this ! What a fantastic scoop, Isabel, getting Emily’s reflections on publication day. I’ve just popped over here from posting my own review and, like you, I’m really excited about this fabulous novel (despite, given the hype, being quite prepared to hate it). Had an “of course” moment in reading this review when Emily notes that all the classic post-apocalyptic novels are dystopian, projecting our anxieties about our current and not quite so distant safety. It seems kind of obvious now, but I really had thought of it that way. Thanks for posting this and enjoy the buzz! What a lovely piece – I very much enjoyed Emily’s reflections on this – and related to them in terms of my own near-future novel. I absolutely can’t WAIT to read this. I am very attracted to novels set in the future. I am drawn to various writers prophecies for the decades and centuries. A friend and I recently argued about the current relevance of Fahrenheit 451 and how it is one of the few “classic” novels that has accurately predicted our time. The idea of the future needing warmth and some of the comforts that have lasted through centuries assists my plotting of two futuristic novels that are mostly a scattering of notes and chapters. 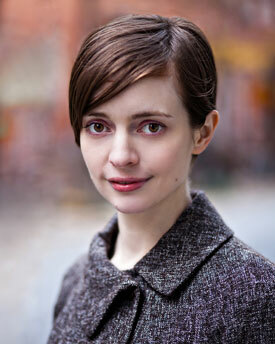 I look forward to reading Station Eleven. Thanks Emily & Isabel. Fantastic post and as a writer contemplating my own novel in a future world, very thought provoking. I agree with Britta that Farenheit 451’s predictions are very close to what we have now and it will be interesting to see which, if any, of today’s dystopian fiction writers get it right!